Mifeprex*(mifepristone) is the first Food and Drug Administration (FDA) – approved non-surgical option for early abortion. Approximately 3 million women in the United States have chosen this option since it was approved by the FDA in September 2000. 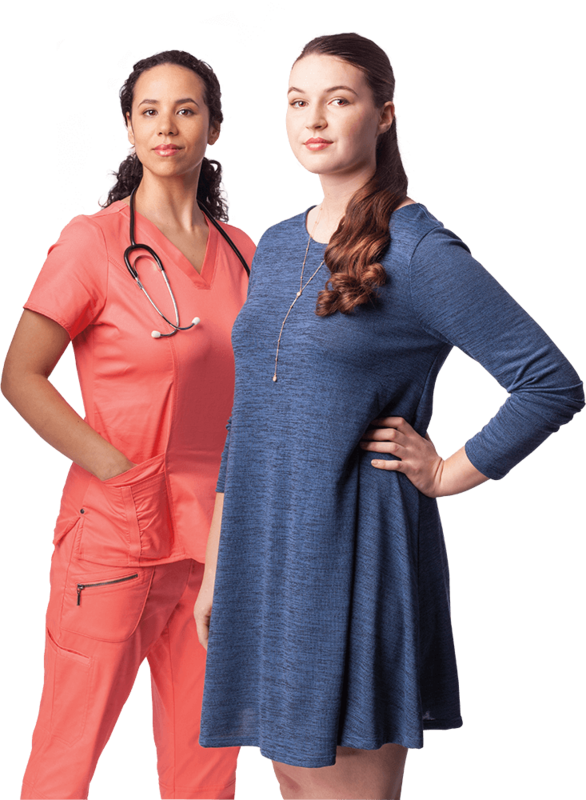 Mifeprex is 93-98% effective for safely ending pregnancy (2-7% of women will need a surgical procedure to end the pregnancy or stop heavy bleeding). Taken orally in pill form and administered in the privacy of a medical office, clinic, or hospital, Mifeprex is a safe and effective way to end early pregnancy. Mifeprex allows a woman to act early when deciding to end a pregnancy. Mifeprex can be taken up to 70 days after the beginning of a woman’s last menstrual period. To learn more about Mifeprex and how this option can be integrated with your standard office practice explore the sections listed on the right. Serious and sometimes fatal infections and bleeding occur very rarely following spontaneous, surgical, and medical abortions, including following MIFEPREX use. No causal relationship between the use of MIFEPREX and misoprostol and these events has been established. Atypical Presentation of Infection. Patients with serious bacterial infections (e.g., Clostridium sordellii) and sepsis can present without fever, bacteremia or significant findings on pelvic examination. Very rarely, deaths have been reported in patients who presented without fever, with or without abdominal pain, but with leukocytosis with a marked left shift, tachycardia, hemoconcentration, and general malaise. A high index of suspicion is needed to rule out serious infection and sepsis. Prolonged heavy bleeding may be a sign of incomplete abortion or other complications and prompt medical or surgical intervention may be needed. Advise patients to seek immediate medical attention if they experience prolonged heavy vaginal bleeding. Because of the risks of serious complications described above, MIFEPREX is only available through a restricted program under a Risk Evaluation and Mitigation Strategy (REMS) called the MIFEPREX REMS Program. Before prescribing MIFEPREX, inform the patient about these risks. Ensure the patient knows whom to call and what to do, including going to an Emergency Room if none of the provided contacts are reachable, if she experiences sustained fever, severe abdominal pain, prolonged heavy bleeding, or syncope, or if she experiences abdominal pain or discomfort or general malaise (including weakness, nausea, vomiting or diarrhea) for more than 24 hours after taking misoprostol. Advise the patient to take the MEDICATION GUIDE with her if she visits an emergency room or another healthcare provider who did not prescribe MIFEPREX, so that provider knows that she is undergoing a medical abortion. 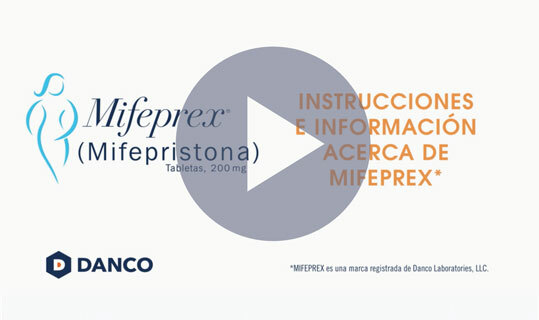 Mifeprex is indicated, in a regimen with misoprostol, for the medical termination of intrauterine pregnancy through 70 days gestation. Use of MIFEPREX and misoprostol for termination of intrauterine pregnancy is contraindicated in patients with an intrauterine device (“IUD”) in place (the IUD might interfere with pregnancy termination). If the IUD is removed, MIFEPREX may be used. As with other types of abortion, cases of serious bacterial infection, including very rare cases of fatal septic shock, have been reported following the use of MIFEPREX. Healthcare providers evaluating a patient who is undergoing a medical abortion should be alert to the possibility of this rare event. A sustained (> 4 hours) fever of 100.4°F or higher, severe abdominal pain, or pelvic tenderness in the days after a medical abortion may be an indication of infection. A high index of suspicion is needed to rule out sepsis if a patient reports abdominal pain, discomfort, or general malaise (including weakness, nausea, vomiting or diarrhea) more than 24 hours after taking misoprostol. Very rarely, deaths have been reported in patients who presented without fever, with or without abdominal pain, but with leukocytosis with a marked left shift, tachycardia, hemoconcentration, and general malaise. Uterine bleeding occurs in almost all patients during a medical abortion. Prolonged heavy bleeding (soaking through two thick full-size sanitary pads per hour for two consecutive hours) may be a sign of incomplete abortion or other complications and prompt medical or surgical intervention may be needed to prevent the development of hypovolemic shock. Counsel patients to seek immediate medical attention if they experience prolonged heavy vaginal bleeding following a medical abortion. Women should expect to experience vaginal bleeding or spotting for an average of 9 to 16 days. Women report experiencing heavy bleeding for a median direction of 2 days. Up to 8% of all subjects may experience some type of bleeding for 30 days or more. In general, the duration of bleeding and spotting increased as the duration of the pregnancy increased. Decreases in hemoglobin concentration, hematocrit, and red blood cell count may occur in women who bleed heavily. Excessive uterine bleeding usually requires treatment by uterotonics, vasoconstrictor drugs, surgical uterine evacuation, administration of saline infusions, and/or blood transfu­sions. Because heavy bleeding requiring surgical uterine evacuation occurs in about 1% of patients, special care should be given to patients with hemostatic disorders, hypocoagulability, or severe anemia. Prescribers must be certified with the program by completing the Prescriber Agreement Form. Patients must sign a Patient Agreement Form. 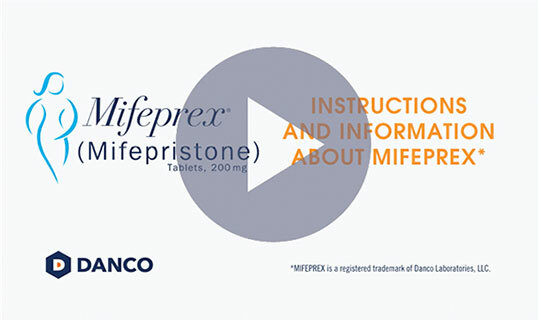 MIFEPREX is contraindicated in patients with a confirmed or suspected ectopic pregnancy because MIFEPREX is not effective for terminating ectopic pregnancies. Healthcare providers should remain alert to the possibility that a patient who is undergoing a medical abortion could have an undiagnosed ectopic pregnancy because some of the expected symptoms experienced with a medical abortion (abdominal pain, uterine bleeding) may be similar to those of a ruptured ectopic pregnancy. Women who became pregnant with an IUD in place should be assessed for ectopic pregnancy. The use of MIFEPREX is assumed to require the same preventive measures as those taken prior to and during surgical abortion to prevent rhesus immunization. Most common adverse reactions (>15%) are nausea, weakness, fever/chills, vomiting, headache, diarrhea, and dizziness. The frequency of adverse reactions varies between studies and may be dependent on many factors including the patient population and gestational age. This is the Important Safety Information. For more information, please see the Prescribing Information, including BOXED WARNING and Medication Guide. Because of the risks of serious complications described above, MIFEPREX is only available through a restricted program under a Risk Evaluation and Mitigation Strategy (REMS) called the MIFEPREX REMS Program. Please see additional Important Safety Information and the Full Prescribing Information.